CARTIER CALENDAR WATCH PEN Cartier, Ballpoint Calenda Watch Pen, No. 1940 / 2000, Ref. ST 190005. Made in a limited edition of 2000 pieces in 2001, sold August 22, 2002. 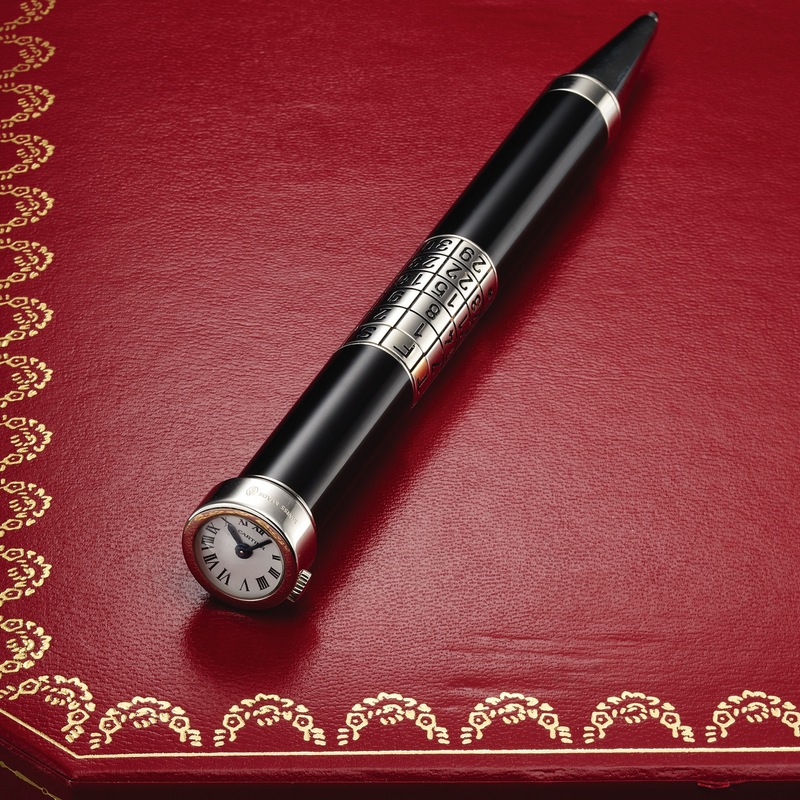 Very fine, black lacquer and platinum-finish writing pen with calendar and quartz watch. Accompanied by the original fitted box and guarantee booklet. The pen body in black lacquer with platinum finished tip, watch case and calendar. Two body, polished, domed crystal. White with printed radial Roman numerals, secret Cartier signature at X. Blued steel epée hands. With quartz standardization. C. The pen body in black lacquer with platinum finished tip, watch case and calendar. Two body, polished, domed crystal. D. White with printed radial Roman numerals, secret Cartier signature at X. Blued steel epée hands. Pen, dial, case and movement signed. OVERALL LENGTH 145 mm. Watch DIAM. 15 mm. THICKNESS 10 mm.